KoAloha Solid Body Tenor Electric! This is a 7 piece neck-thru solid body tenor from the ever innovative KoAloha company. Not only is it the coolest thing I’ve ever seen but the sounds you can get are endless! KoAloha knocks this one out of the park. Check this out! Are these up for sale? Beautiful, Andrew. And that Corey, he can play uke like ringin’ the bell! 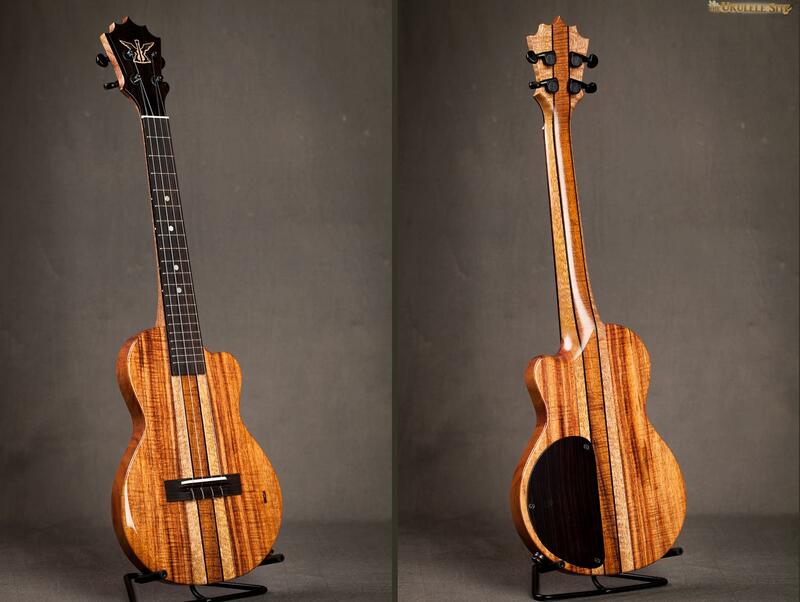 I would love to have one of those KOALOHA SOLID BODY TENOR ELECTRIC UKULELES. It would go well with my Kala California Ubass. Very cool looking and sounds great. It sounds more like a small guitar than an electric ukulele to me, but maybe that’s what they intended. Beautiful Ukulele…and the sound is great!! how many are the building ? and my pal Corey is amazing..
good fun yesterday hanging with You,Mike and Corey…thanks Bruddah! Thanks for your help at the uke fest Len. Beautiful sound. Cory plays beautifully and makes it sound like butter! nice job!!! Wow. Range of sounds is tremendous. Surely those were different effect chains, amps, or amp sims. Can you share some secrets there? Thanks Jim. I ran him through the Boss DR-880 and flipped through presets while he jammed. For anyone with plug-in capability I strongly recommend that drum machine for the quality of sounds, amp sims for recording, and 500 preset drum/bass grooves. You can see the chord changes and and practice along or program your own progression. Awesome tool. I wish I could afford this uke. Can you try to convince the KoAloha guys to put this into production? Hi, Andrew. I second the putting this into production by Koaloha. Q: Is the body size the same as a KoOlau tenor CE-1? It seems that the KoAloha body is slightly smaller, judging by how Corey’s holding it, but could be illusion. Also, is this body routed out/hollowed like the KoOlau Ce series? If not, I assume it wouldn’t play as well as the quiet, yet lovely, unplugged KoOlau Ce, right? They are both using the same pickup and preamp. The main difference with this KoAloha is that it’s a solid body, not chambered. So ya, not as much volume acoustically, but may be better for more electric guitar like applications. and when plugged in the “regular” ukulele tone is amazing. thx Steve. What is the small ??? on the face of the uke? Volume??? Wow this uke sold fast huh?